TSE launching the vote from the exterior of the country. Salvadorans living outside of El Salvador can now enroll to vote in the 2014 elections. To be able to vote, an ex-pat from El Salvador will need a national identity document (DUI) with his or her foreign address outside of El Salvador. With that DUI, you can go to the website of the Supreme Electoral Tribunal where there is a form to register to vote in this manner. A look at the websites for international development agencies, shows a great deal of attention being paid to public-private partnerships. In El Salvador, a public private partnership law (the "P3 Law") supported by the Funes administration and the United States, would create a legal framework allow an increased use of such partnerships. The National Assembly just passed the law on a unanimous 84-0 vote. 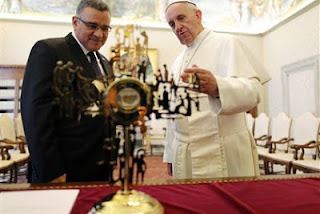 Salvadoran president Mauricio Funes visited Pope Francis at the Vatican today where they talked about the possible canonization of Oscar Romero. President Mauricio Funes complete his fourth year in office on June 1. A poll from the Universidad Tecnológica asked Salvadorans how the president was doing. On a scale of 1 to 10, respondents gave Funes a grade of 6.5. Almost 52% agreed with the statements that Funes' actions were focused on addressing the needs of the poorest members of Salvadoran society. When asked who president Funes' decisions had favored, 34.2% said the people, 27.0% said Funes himself, 12.7% said "the Left", 3.5% said "the Right," and 8.8% said the business sector. One interesting question is how much Funes' favorable approval rating will help the chances of his vice president, Salvador Sanchez Ceren in his run for president in 2014. They have not really been seen as part of the same team, despite being part of the same political party. I can't think of the last time they made a public appearance together. There was a lot of reaction over the weekend to the news that the Constitutional Chamber of the Supreme Court had ruled that the Minister of Public Security and the Director of the National Civilian Police (PNC) were both named invalidly because both were ex-military officers. President Mauricio Funes indicated in his weekly radio call-in show that he would comply with the ruling of the Constitutional Chamber. While he criticized the judges for having an anti-military philosophy, he said that democratic order required that he comply with the ruling whether he agreed with it or not. Former president, and current presidential candidate, Tony Saca applauded Funes' decision to promptly comply with the decision as the appropriate one and indicated agreement with the court's ruling. The Constitutional Chamber of El Salvador's Supreme Court declared today that the Minister of Public Security and the Director of the National Civilian Police (PNC) were both named invalidly because both were ex-military officers who had retired just before taking their civilian jobs. President Mauricio Funes had named the former Minister of Defense general David Munguía Payés to be Minister of Public Security and retiring general Francisco Ramón Salinas Rivera to be Director of the PNC in November 2011 and January 2012 respectively. These appointments came despite criticisms from his own party and human rights groups about the appropriateness of naming military men to be in charge of civilian policing. I just finished reading an excellent new white paper titled The El Salvador Gang Truce and the Church: What was the role of the Catholic Church?. The paper is written by Steven Dudley, one of the directors at Insight Crime, and is the first of a whitepaper series from the Center for Latin American and Latino Studies at the American University. The rainy season in El Salvador begins in May. The rain storms of the season bring the possibility of flooding each year along the country's rivers and mudslides across its volcanic slopes. This map shows all the areas of the country which were impacted by Tropical Depression 12-E in 2011, and provides a good illustration of the areas at risk each and every year. El Salvador's Civil Protection Commission has identified 2671 zones at risk from the rainy season weather which is forecast to include as many as 14 tropical storms in the western Pacific and 18 storms in the Caribbean and Atlantic. The Commission also reported that it will be spending more than $75,000 on a project to reduce flooding by the Río Grande de San Miguel which has overtopped or broken through levees and flooded the community of Puerto Parada in Usulután on a regular basis in recent years. The case of a young woman in El Salvador, known only as Beatriz, drags on without resolution, and has drawn increasing international attention. Doctors say that she needs a therapeutic abortion to save her life, but El Salvador's absolute anti-abortion law prohibits it. Appeals to El Salvador's Supreme Court have produced no results. You can read the latest developments at the Guardian and from al Jazeera. The reduction in the homicide rate in El Salvador which began with the gang truce in March 2012 has continued through the first four months of 2013. The National Civilian Police report that there were 764 homicides in January through April, down 502 murders from the same period the year before. The PNC also reported a 63% reduction in murders of women. The murders are down, but there is little analysis available of who the victims are and whether there are fewer murders proportionately in the so called "cities free of violence." The same report also indicated that there has been no reduction in robberies, kidnappings or extortion.